Glyndwr's Way National Trail01597 827562work Walking RouteThe 132 mile Trail which was officially opened in 2002, is set in the heart of Wales' breathtaking countryside and is dedicated to the 15th Century Welsh warrior and self proclaimed 'Prince Owain Glyndwr'. Many, unable to take the 9 days needed to complete the route in one go, enjoy the Trail over a series of weekends or day trips. Along the Trail are some of the finest landscape features in Wales including the serene Radnorshire Hills, the shores of the Llyn Clywedog Reservoir and heather clad Plynlimon. There are spectacular views over Cader Idris, Lake Vyrnwy, the Cambrian Mountains and Y Golfa. The route reaches its highest point at Foel Fadian (1,650ft - 510m) from which on a clear day views stretch out along the majestic Dulas Valley to Machynlleth and the sea. The trail begins at Knighton on the English borders and meanders its way through the open moorland, rolling farmland, woodland and forests of Mid Wales to finish beside the Montgomery Canal in Welshpool. The Offa's Dyke Path National Trail connects Welshpool and Knighton and offers a circular option for those wishing to complete the Trail as a continuous walk. 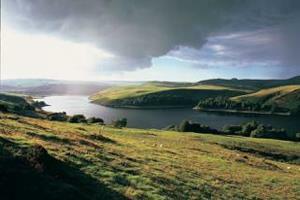 * Landscape : Open moorland and rolling farmland with woodland & forests. * Highlights : Glyndwr's Parliament House in Machynlleth, Lake Vyrnwy, Llyn Clywedog reservoir, views over the Cambrian Mountains. * Famous associations : Owain Glyndwr and Llywelyn Ap Gruffudd (the last true Welsh Prince of Wales). * Trail Officers favourite part:: Glaslyn & Foel Fadian because of the contrast of the moorland at Glaslyn with the spectacular view at Foel Fadian down the Dulas Valley looking out to sea. * Nearest towns : Knighton, Llanidloes, Machynlleth and Welshpool are on the Trail. Shrewsbury is 20 minutes away by train, Swansea is 3 hours. * Access : London Euston to Shrewsbury is 3 hours (changing at Birmingham or Wolverhampton). Birmingham to Shrewsbury is 1 hour and Shrewsbury is 50 minutes from Knighton, 1 hour from Machynlleth and 20 minutes from Welshpool. London Paddington to Swansea is 3 hours, Swansea to Knighton is 3 hours. * Finish point :The public park next to the canal in Welshpool. The 132 mile Trail which was officially opened in 2002, is set in the heart of Wales' breathtaking countryside and is dedicated to the 15th Century Welsh warrior and self proclaimed 'Prince Owain Glyndwr'. Many, unable to take the 9 days needed to complete the route in one go, enjoy the Trail over a series of weekends or day trips. * Information available : A set of 16 leaflets are available of the route, produced by the Countryside Council for Wales and Powys County Council and are available from TICs. A Glyndwr's Way Accommodation Guide has also been produced and is updated annually; it is available from Knighton TIC and other TICs along the route.